Scandinavian hygge designs are very popular during the winter season. The contrast of the red floss against white fabric is the perfect combination for the holidays, but you can stitch these up all season long. Hearts, woodland animals and snowflakes are a central theme with Scandinavian cross stitch. You will see a lot of Fair Isle patterns mixed in with winter wonderland themes. While red and white are the traditional colors for Scandinavian patterns, you can get creative and mix colors, either going bolder or more pastel. One of the first images that comes to mind with Scandinavian design is the Dala horse. These colorful creatures are synonymous with Swedish style. The name comes from the province, Dalarna, in central Sweden. They often have been used as toys, symbols of strength or good luck. This pattern from Lovemeoks Embroidery showcases the Dala horse in all its vibrant color. When most people think of Scandinavian cross stitch, they think of the holidays and Christmas. It seems like the two go hand and hand. It is no wonder, given that Scandinavian countries really embrace the winter season. Prairie Schooler created a pattern that combines Scandi design with primitive images that embrace the holiday spirit. If the green and red colors don't grab you, switch them up for something more unconventional. Another very popular image in Scandinavian cross stitch design is a heart and ost of the heart patterns involve Fair Isle imagery. While these patterns are usually winter themed, but don't limit yourself to stitching up these projects just for Christmas. These also work well for Valentine's Day. A scented sachet, little purse or just a wall hanging works great for these patterns. If red isn't your color, you can cross stitch it to fit your style. If you have the hygge spirit, you have a warm heart that is open to all! The very meaning of hygge is being cozy with friends and family. Riverdrift Needlework shares this beautiful and detailed Hygge Heart cross stitch pattern. While this pattern seems complicated, it is actually very easy and perfect for beginners because it has no half or quarter stitches. The kit includes white 14 count Aida fabric, Anchor 6-stranded embroidery threads, chart on an A3 sheet, instructions and a gold-plated needle. Scandinavians are very proud of their heritage. They are a generally very happy people and why not–they have found the secret of being happy during a season that is cold, wet and dark! Celebrate Nordic heritage with this free Beloved Norway cross stitch pattern. It can be cross stitched as a bookmark or on a bigger scale as a wall hanging. Hearts are a reoccuring theme in Scandinavian cross stitch design. You will see them all year round but most prominently during the winter season. These tiny heart sachets can be stitched in any color you desire. Fill them with lavender or other herbs for beautiful scented decor. Monogram each heart for a personalized gift. The gang at Craftsy have taken the traditional Scandinavian design and updated it with their pattern for a Nordic Octopus. This project is fun, whimsical and out of the ordinary. Cross stitch a pillow for a winter beach house or try your hand at embellishing your favorite holiday sweater. This pattern brings out your inner hygge fisherman. So many of us have our own version of woodland life during the winter. We think of the calm stillness of the snow with wildlife thriving during the cold. Kissy Cross shares this theme of a cozy woodland scene with her free pattern for Rudolph Kranz. 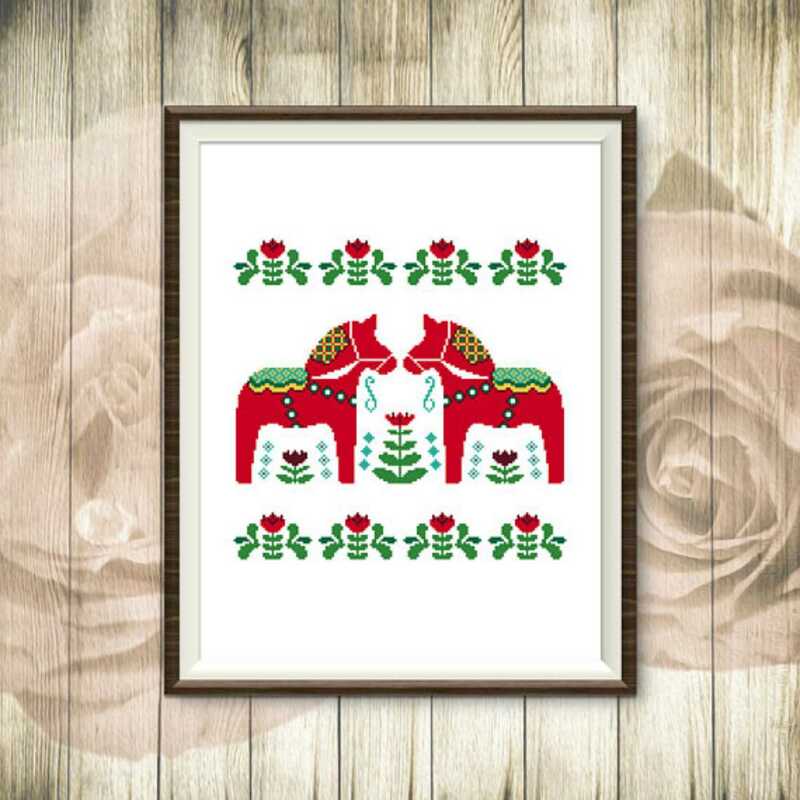 It is a simple yet beautiful pattern that can be used for an ornament or wall hanging. Twenty-five days of coziness. Twenty-five days to enjoy being with family and friends. Zindagi Design celebrate the winter season with this Nordic Christmas Sampler. The pattern can be cross stitched as one piece, as an advent or individually as small ornaments or sachets. 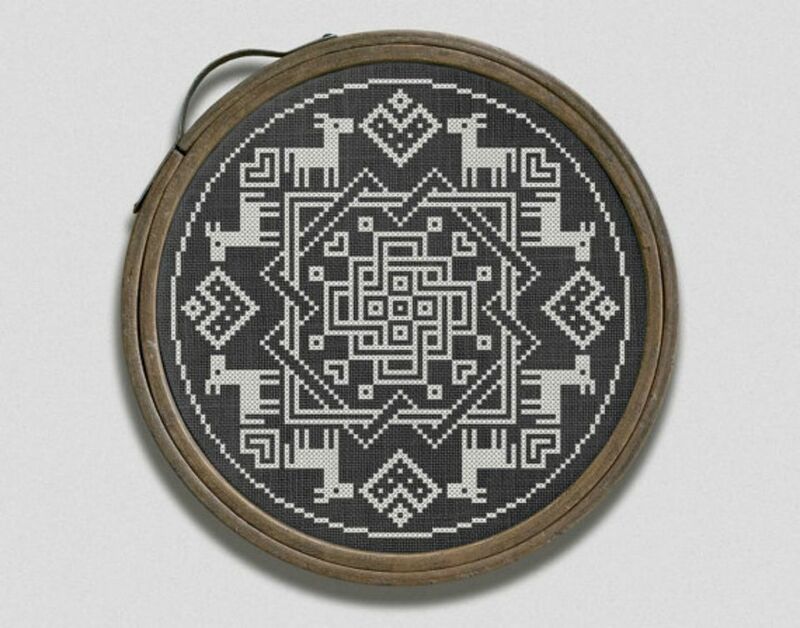 Modern Folk combines Celtic knots with Scandinavian images for this fun twist on traditional cross stitch. The pattern would make a wonderful additional to your hygge inspired decor. While the pattern is meant to be stitched monochromatic, you certainly can add more colors to fit your personal style. Cross stitching Scandinavian designs is the perfect way to celebrate Hygge. You can settle in for the winter, build a fire, have a cup of tea and stitch the night away. Maybe if you are lucky, you can watch the snow fall between stitches. No matter what the weather is, the Scan designs will get you in the hygge spirit.